owning a business is a mundane obligation undertaken with the sole purpose of paying the mortgage and putting food on the table. But for those lucky enough to have found true passion and purpose in life, going to work every day is a joy. it seems, we are all trying to live a greener life—but few of us have considered what it could mean to die a greener death. A group of Denman Islanders have been doing just that. 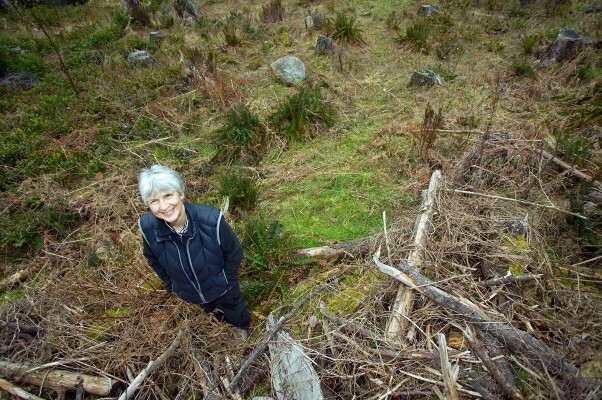 With the appropriate acronym DIMS (Denman Island Memorial Society), they are spearheading a community initiative to create what will probably be Canada’s first entirely green cemetery. DIMS is, in fact, joining a modest but growing green burial movement. The first natural burial ground was created in 1993 in the United Kingdom, where there are now more than 200 such sites. In Canada, two cemeteries (one in Victoria and one in Ontario) have created natural burial areas within the larger, conventional cemetery. Closer to home, DIMS members have been in touch with groups from Salt Spring and Pender Islands wanting to include a green area as part of their cemeteries. For many people, the attraction of green burial is less to do with poetry and more to do with science—environmental science, to be specific. Conventional burial violates the environment in quite a number of ways. The building of big concrete vaults for families hugely disturbs the earth. Heavy caskets take decades to biodegrade and usually include toxic materials. Embalming fluid renders the human remains toxic, as well. Also, the standard design of a cemetery is distinctly unfriendly to the environment. Typically, the site is extensively cleared. New species, often non-native, are planted, and large swaths of lawn are maintained with chemicals and copious watering, both poisoning and depleting the groundwater. Huge gravemarkers, often placed on concrete foundations, further disturb the natural order. Green cemeteries are considered to be nature preserves; flower gardens and lawns, and the related use of fertilizers and pesticides, are not part of the picture. The sites are marked with simple indigenous flat stones, other small structures, or plants, rather than big heavy markers. While natural burial is currently a new trend, driven by environmental concerns, it is also a very old practice. Historically, North America’s settlers very likely practiced green burial, and today, some remote Northern communities, isolated from government-certified undertakers, morticians, hearse drivers, and all the other paraphernalia surrounding the business of death, simply put their bodies in the ground. On the other hand, practices to preserve the body in an undeathlike perfection are as old as ancient Egyptian mummies. Although natural burial sites meet all the required health and bureaucratic standards, the whole idea can be simply too “out there” for many North Americans. After all, death is hard enough to deal with, and people may feel more comfortable when things remain sanitized and conventional and a little less… earthy. “Society in general is adverse to the whole microbiological world,” says Dr. Doreen Tetz, a general practitioner on Denman who, along with Local Islands Trust representative Louise Bell, met with me to talk about the green cemetery project. Both are members of the DIMS Cemetery Project Committee. “Modern burial practices evolved as part of a general movement in the early part of the last century for everything to become more sanitized, after antibiotics were discovered,” explains Tetz. “And yet,” continues Bell, “what actually happens to a body as it is being prepared for conventional burial is actually really gross! People just don’t know it.” Bodies are stripped, shaved, washed with disinfecting chemicals, massaged and manipulated; formaldehyde is injected into the circulatory system and into the body cavities. The mouth may be sewn shut and devices are used to set the face in a proper expression. So much indignity and mess for a process meant to preserve our dignity! Thus far, Bell, Tetz, and their colleagues on the DIMS Cemetery Project Committee have found Denman Islanders very supportive toward the project, speaking in favor of it at public meetings, and participating enthusiastically in a recent table-tennis tournament fundraiser. In fact, say Bell and Tetz, there has been no opposition—perhaps, says Tetz, because this community of avid gardeners, composters and farmers tends to be somewhat more comfortable with the “whole microbiological world” than others. But mainly, says Bell, Denman Island has needed a new cemetery for years. With the old cemetery full, locals have had to send their loved ones to other communities to be buried. Bell’s extensive experience dealing with the intricacies of government agencies has proven to be very helpful. As is typical when someone wants to do something new with land use, there is a daunting amount of bureaucracy involved. In fact, more than two thirds of the budget for the cemetery goes toward bureaucratic costs such as rezoning and subdivision fees, land appraisal fees, applications to the Agricultural Land Reserve and the BC Business Practices and Consumer Protection Authority, which oversees all things burial-related, as well as the legal work, surveys and consulting needed to accompany all this. DIMS’ very first challenge was perhaps the largest—they needed to find someone to donate an appropriate piece of land. Luckily, they soon found a willing donor: the Denman Conservancy Association (DCA), a well-established non-profit conservation society that owns a number of properties on Denman, stepped on board. One of DCA’s flagship properties, the 60-acre Central Park, has one corner that is adjacent to the old cemetery. After some deliberation—including discussion about how to legally ensure that the new cemetery honoured the conservation values that are intrinsic to DCA’s mission—the DCA board agreed to donate a hectare of Central Park to DIMS. This meant DIMS could celebrate, but not rest. Founding a cemetery is not a simple project. Fundraising is particularly challenging, since “cemeteries” are completely off the radar of funding agencies, says Tetz. Also complicating things is the fact that burial is a highly regulated field, with legislation covering not just cemeteries, but also who can deal with human remains. “For instance, you aren’t allowed to touch or to transport a body without special certification,” says Bell. The DIMS group is looking at ways to work within the regulations while keeping the burial process at home on Denman. This is part of a larger movement in the way families handle death and dying, says Tetz. “Over the course of my career I’ve seen a really large shift. It used to be death happened mostly in hospital, often alone. As a doctor, I’d be called in to pronounce someone dead. I wouldn’t know them; I wouldn’t know their family. So I’d end up making a call to someone I didn’t know, on the other side of the country, to tell them that a family member had died. “Now, more and more people die at home, with their families around them—while still receiving the best medical care,” Tetz adds. “Families have been reclaiming that event in their lives. But all that stops when someone dies. The body goes off the island into the hands of strangers. Bell is keeping meticulous notes of all the steps DIMS is going through to achieve its goal, with the intention of being able to offer help to other communities who are interested in creating a green cemetery. Death, after all, is a part of life, and it makes sense for people to want their death to mirror the values they live by. The new Denman cemetery will offer this possibility to all those who value environmental sustainability and connection to the local in their lives, by providing a place where they can comfortably return to the earth, in their own communities, after their death.